I knew before I left the house that the route to my destination would most assuredly include miles of bumper-to-bumper traffic before I reached the other side of Houston. I set my mind to enjoy my trip no matter what and made sure to leave the house early enough to avoid the late afternoon rush hour. I must admit there were moments which threatened my deliberate peace, but I was strong and resisted with my mantra “it doesn’t matter….you have plenty of time…enjoy the journey…” I was prepared for the trip – I knew where I was going, had adequate fuel, snacks and water. It’s easy to enjoy the journey when you are prepared. I had been anticipating the retreat for months and with every mile that drew me closer, I could feel the pressures of the every day falling away. 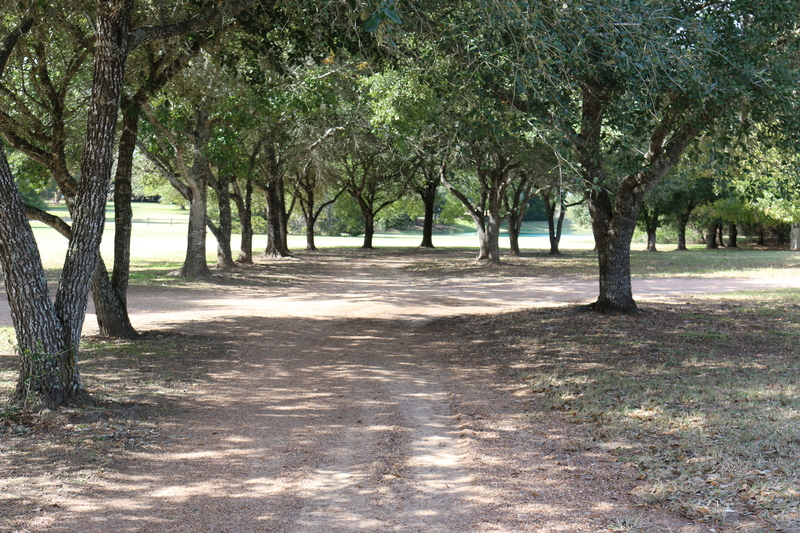 As I drove onto the grounds of my destination an even stronger sense of quiet washed over me. The kind of peace that you can drink in with every breath. Surrounding stillness that felt as if it were an alternate universe where tight muscles and tense nerves do not exist. Beauty of nature that softly beckons to let go of everything else and simply take it in. A setting that clearly whispers be still and know that I am God. I happily unpacked my things in the quaint, cozy room where I would spend the weekend. There was plenty of time to get settled in and relax before the evening’s events. I scanned my emails and messages to be sure that nothing important was left without a response and took a moment to review the latest social media posts. It was there I learned of the attacks in Paris. I quickly searched the web for more details as the sense of impending doom was knocking at my door. This is our world and the inability to be prepared for these kinds of horrific acts strikes fear in our hearts. The threats are bold and fierce and very real and we are at a loss as to what to do. I gathered the initial facts and put down my phone. Seeking Him quickly is the only way to turn away the fear of impending doom. I offered up a familiar prayer of “God, I don’t even know what to pray!” In times past, that would be the end of a quick “God help them. God be with them.” prayer, but I have since learned to be still and literally ask God “What do You want me to pray?” It is not hard to understand and pray for the immediate need for safety and comfort and protection for those who remain in the wake of the horror. But somehow it still seems lacking. In this great mystery that is prayer, God, who knows what we need before we ask, has chosen to involve us in a supernatural process. The more I’ve grown closer to Him and the more I’ve sought understanding, the more it has become evident that I really don’t know very much. Perhaps He will give me deeper understanding of why He involves us in the process. Or maybe He won’t. But He is teaching me more and more how to pray and that with or without understanding, He requires obedience. If the bible is true and He is God and He knows everything and I cannot do anything (eternal) without Him, then it is very clear that I must learn from Him what to pray. We can spend much time in worrying and fretting. We can scream our opinions and blame our politicians, publicly shaming them for what we perceive as their lack of action to keep us safe. We can cry and moan and fear for our lives, and spread the fear to those around us. We can beg and plead with God to do something!! But is that really who we are? Is that what we are called to?? We must learn to quiet our souls. It is clear that He intended for us to participate in this: “I (David) have calmed… (You) Do not let…” We are able to bring our mind, will, and emotions into submission to His Spirit, which is the spirit of Peace. We must find that place of peace so that we can clearly hear His words to us and learn how to act in times of trouble rather than automatically react in our flesh. There are days I ask myself why I am so surprised when trouble comes. Duh. Jesus plainly said there would be trouble in this world. Our ability to quiet our souls and not be afraid comes from the confidence that we are not OF this world. THIS LIFE IS TEMPORARY. Perhaps it’s time for us to step back and get a new perspective. This life has purpose and meaning and is important to God, but it is a wisp, a vapor in time compared to eternity. What did God tell me to pray when I heard the news of Paris? He told me to pray that in midst of the pain and chaos and grief people are experiencing that they would find Him as Savior. He told me that the mission remains the same, Tell others about Me. I won’t be traveling to Paris to tell others about Jesus. But I will be putting feet to my prayers for those in my neighborhood. It’s not just the people of France who are afraid. It’s our families, our friends, our neighbors. If we are afraid right along with them, we have no message of hope to share, no comfort to give. Photograph by Kay Stinnett and cannot be used without permission. I love how God orchestrates the details of our lives. I had no intention of returning to work beyond the walls of my home but I knew when He was leading otherwise. Once I determined to search for a job, my criteria was very simple and specific for the “right” position. First, it had to be part-time. I wanted to continue my business as a seamstress and I wanted to have time to write and speak and teach. Second, I didn’t want to have to go through a great deal of training. I know it sounds a bit lazy, but I just wanted a no-brainer kind of job. Something easy. In sharing this new direction with a friend, she suggested that I go by her chiropractor’s office as she thought they were looking for someone. I did and they were and it was exactly what I was looking for. Sweet! So for the past few months I’ve been working part-time for a chiropractor whose practice expands into the scope of wholeness – treatments and consultations that go beyond structural adjustments and into the areas of nutrition and health. (Talk about accountability in what I pack for my lunch on work days!) His knowledge of how the body works (or doesn’t work) physically, mentally, and emotionally is vast and I am learning a great deal from our conversations. Being of a certain age and dealing with the challenges and frustration of this certain age have proven more than I’ve been able to manage as well as I’d like on my own, so finding this position is simply one more revelation of His perfect leading in my life. I am finding answers. Slowly. One by one. This is not my preferred method to arrive at solutions. And He’s uncovered a layer of discontent. I truly am in the best time in my life, but I’ve found myself more irritable and frustrated lately than usual. Some days I haven’t wanted to look deeper than the outer layers, so I’ve blamed my grumpiness on being tired. A lot. And I am tired, but God is peeling away whether I like it or not and showing me that this layer of discontent is one of the things that is making me so tired. As I’ve taken the time to look at this layer, most of the things I am discontented with are small things. A few are bigger things with which I am frustrated because there seems to be no progress. And of course, last but not least, I am discontented with myself. Again, nothing major, but a clinging dissatisfaction with my own personal progress. If I will learn that I am in vital union with Him – I cannot be separated from Him – and I draw my strength from this knowledge daily, sometimes breath by breath, I will be content. He is enough that I need no other assistance. He is in me and I am in Him and this fact alone makes me sufficient for whatever lies before me. There have been a few tears in this peeling of the onion that is revealing my areas of discontent, and there will likely be a few more before it is all said and done. But I will continue my education. I will learn to be content. This is CJ, our new dog. He’s 62 pounds of solid muscle with a scary sounding bark to those who don’t know he’s really a softy who loves people. He seriously enjoys taking me for a walk and will approach with confidence any other living thing we encounter. But he has a secret. He’s scared of thunder. He’s had a difficult time lately as we have experienced week after week after week of severe thunderstorms where we live. He paces the floor in an effort to find a safe place, his whole body shaking in fear. 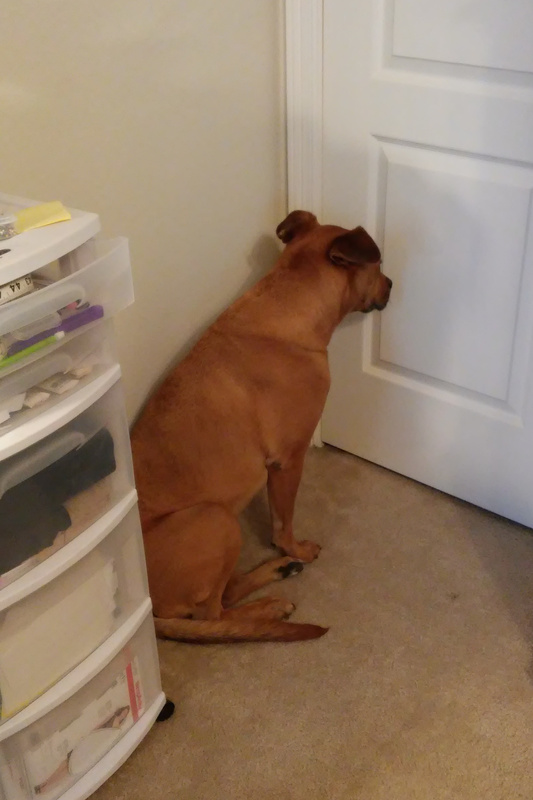 This is what he chose one day last week – to stand in the corner and face the door. I imagined he was saying to himself “Just don’t look and it will all go away…” He stayed there for over an hour. I’m new to this whole dog ownership thing in that this is the first time in a long time I’ve had a dog I actually wanted to interact with. Before adopting CJ, I had never walked a dog on a leash, taken one to a veterinarian, considered whether or not the dog food was acceptable, or been willing to tolerate the hair that now seems to be everywhere. I find myself strangely concerned about how he feels and if he is happy in his new home. And I hate it when he’s scared. I am there with him through the storms and I do everything I can to let him know it’s ok. But short of learning how to speak dog, I am at a loss as to how to convince him that he is safe. The scary sounds are louder than the truth. I spent a great deal of my life trying to hide the fact that I was scared. From my earliest memories, fear has been a predominant emotion, many times undefined and most certainly unspoken. How can you tell someone you are afraid when often you don’t even know what you’re afraid of? A vague sense of impending doom always seemed to hover near. Through the years and some pretty major life errors, this fear grew and I became afraid of life’s storms. Past failures were the thunder that boomed of my incompetence in life and deepened my dread of the failures that were surely ahead of me. I’ve paced when the inevitable storm was approaching, I’ve trembled during its onslaught, and I’ve crumbled in the aftermath. And for the most part, I’ve kept it to myself. It was easy to hide my secret because I’ve always been an optimistic and generally happy person. But this only accentuated the inward conflict. I was a strong and confident person in so many ways. But when I found myself alone, particularly at night, the clouds would roll in and the thunder would sound, and I would succumb to the fears once again. I even attempted to let down my guard and ask for help a couple of times. The ones I entrusted with my secret found it impossible to either understand or believe as my personality and attitude were more convincing and they didn’t take my fears very seriously. They offered simple advice and familiar scriptures and I politely walked away believing that this kind of vulnerability just wasn’t worth it. So I stayed silent. And afraid. Many who do not believe in God or Jesus or the bible often quote this scripture, but they only quote the second half – that the truth will set you free. If that were so, then everyone would be living free lives because the Truth has come. The existence of truth is not what sets us free. It’s the truth that we know that sets us free, and this knowing is more than the intellectual acceptance. It is truly believing the truth because it is the truth and not based on how we feel. I’d quoted the scriptures and spoken the prayers, seemingly to no avail. I did all that I knew to do and nothing worked because I didn’t know the truth upon which all others are based: God loved me. I intellectually accepted that He loved me because the bible said so and let’s face it, He is God and God is love, so He had to love me at some level. But in the dark hours when the fear swelled, I didn’t really believe the truth of His love. The scary sounds were no longer louder than the truth – God loves me and His love abides within me. I have the power to drive fear away and to live an abundant, free life, because now I know: God loves me. Some of you mothers and fathers will understand how happy I am when my daughter calls me to ask what I think, or even better, to ask me to pray for her when she has a need. We’ve been close throughout her life, but of course there were years where she most definitely did not want to know what I thought. I remember myself at that age. Thinking that surely I was hiding my inward eye-rolling as I listened to and ignored my mother’s words at the same time. (I had yet to learn that I am one of those people who simply cannot hide how she feels and that I would successfully pass this trait on to my daughter.) When she calls (or texts), there is no matter too small or too unimportant or even too vague to be able to completely describe for which I will not immediately approach the throne of our Father on her behalf, and be honored to do so. Last week something was troubling her but she couldn’t quite put her finger on it. She had wrestled with this disturbance for several days with no real understanding. So when I received her early morning text asking me to pray, I responded to reminded her that God’s ways are peace and love, that He gives wisdom liberally when we ask, and that He would reveal to her what the root of the problem was and let her know if it required any other action besides casting her cares. And I prayed for exactly that. She called later the same day to share with me what God had revealed to her. Problem solved. Peace restored. And a mother’s heart blessed. She has learned to be sensitive to her spirit. (She was listening!!) This is the foundation of what it means to be made in His likeness, to house the very presence of God within, and the only way we can learn to yield our body and soul to His Spirit. This is the filter through which every thought, emotion, and experience should go so that we can discern what is pleasing to Him. This is the way we take every thought captive to obey Christ and live as conquerors in this life. We are spirit. We have a soul (mind, will, emotions). We live in a physical body. Our spirits have been made new. We are new creations, old things passed away, all things become new. We have been made alive in Him, the righteousness of God, holy, blameless, and forgiven. We have been given immeasurable love, unsurpassed peace, inexpressible joy, the same power that raised Jesus from the dead, and unbroken fellowship with God Almighty Who has chosen to overtake us and make us like Him. Without this understanding, without truly believing this is who we are rather than just singing the praise songs and quoting the verses, we live frustrated Christian lives, constantly battling the turmoil in our souls, unable to determine which thoughts and emotions are from Him and which are our own. So how do we tell what is from Him and what is from our own flesh or the influence of the devil? There is a line that divides the soul and spirit. The only way to discern the difference is through His word. Studying what scripture says and allowing Him to speak to us through the written Word. Spending time developing our fellowship with Him so that we are sensitive to when He speaks. Agreeing with Him that He has given us everything we need pertaining to life and godliness and is our ever-present Help in times of trouble. Believing that we have truly been made new and taking that as our identity rather than basing who we are on how we look or act or feel. He’s been watching her all her life. He’s whispered to her time and time again but she didn’t hear. He yearns to hold her and comfort her as she struggles. It’s going to be all right, she just doesn’t know it yet. She trembles with the fear of the unknown as her circumstances have stripped her of her identity. She is strong, she just doesn’t know it yet. The love that had been her foundation has been ripped away. She yields to the new identity that presses in on her: the unlovable. She is immeasurably loved, she just doesn’t know it yet. This roller coaster ride of choices makes her sick. She hates herself because of her weakness. His opinion of her remains unchanged, she just doesn’t know it yet. Loneliness is her constant companion as no one wants on this ride with her. She is not alone, she just doesn’t know it yet. She goes through the motions of living while she entertains the thoughts of ending it all. Her earthly life has eternal purpose, she just doesn’t know it yet. Defeat hangs over her like a thick black cloud as she cannot go back and change the past. Her knees buckle under the weight of the consequences. She is redeemed, she just doesn’t know it yet. She grasps to find hope in the words she reads and the messages she hears, but it seems she is grasping at air. She is full of hope, she just doesn’t know it yet. Her tears are constant from the pain of this deep, gaping wound from which she believes she will never recover. She is healed, she just doesn’t know it yet. Her life is changing, she just doesn’t know it yet. I woke this morning thinking of the followers of Jesus many, many years ago who awoke on this day in between. They had walked with Him and talked with Him and believed in Him and now He was dead. The fullness of understanding had not come to them yet and they find themselves striving to put the pieces together. I imagine what it was like as they recall and discuss with one another the things He said as they openly share their grief for this Beloved One who is gone. Some silently grieve over the hope they feel is dying as doubts and fears begin to creep into the sacred place of their broken hearts. The mighty work being done was invisible to them, as are all things of faith in the beginning. Some found strength in numbers, remaining with their fellow believers. Others pull away searching for clarity in the solitude where no one can touch their pain or expose what they are afraid is their faithlessness. Still others cannot be still, pacing as they try to find something to do that will ease their sorrow and clear the fog of the unknown, not realizing that nothing they could ever do would impact the outcome of His marvelous plan. They cling to the words of promise uttered from His lips but they do not see the fulfillment. The frustration of things left undone is ready to overwhelm if they will let it have its way. Emotionally and physical exhaustion cause the hours to pass slowly. Sometimes the waiting in between is hard for us also. We find Him and His promise that sin is conquered and that we will be free from its grip and destruction. We know from the depths of our spirits He is real and His promises are true. But we look at ourselves and it appears we are unchanged. We cannot always see the work He is performing in our own lives and if we are not careful the frustration of things that seem undone can overwhelm us. Fears and doubts stand ready to creep in and convince us that we are not really changed after all. Oh, sometimes there are obvious things that we need to do. We need to read and study and fellowship with those who will love and encourage. We need to recall and discuss the things we were taught of Him. But when we understand that it is by faith that we receive Him and by faith that we receive the victory over sin, we can learn to stand in faith while we wait, our faith placed in His power to change us from within and work out this wonderful salvation in our every day lives. Faith that one day our transformation will be evident on the outside. Those believers many years ago stood in between the cross and the resurrection and they waited. We stand in between the power of the resurrection and the perfection that heaven will be. There is no way around it, there is time in between. This time of our existence on earth is important and He will make it significant in His way and His time. But let’s not forget that this is not the end goal. One day we will be with Him after the in between. Year after year family photographs were captured, always with one family member absent as someone had to operate the camera. The boys were attired in their once-a-year suits and ties. We girls had new dresses and white shoes which embarrassed me as my spindly legs made it appear as if I had unusually large feet at the ends of them. We were dressed up to go to church for Easter services. We regularly attended Sunday service, so the only difference on this particular day is that we would be especially dressed and it would be more difficult to sit on our right-side, third-row-from-the-front pew if we did not arrive earlier than usual because many more people would attend this day. The pre-service preparations involved the same flurry of activities as every other Sunday morning – the search for lost shoes and belts, the efforts to keep children clothed and still without spills or stains, and the prayer that one particular child would not get carsick on the way. It’s a wonder my mother ever was able to relax and worship once she entered the sanctuary doors. While we did not attend a church rich in liturgical traditions, we were taught the true meaning of Easter and what the Lord’s Supper represented. The colored eggs and plastic grass in baskets and races to collect the greatest numbers did not detract from what I knew, even as a child, to be true. Jesus died for my sin. I placed my faith in Him early and throughout my struggles and challenges with life itself, this was and is the unwavering platform on which my feet remain firmly planted. And yet, I missed a critical truth even as every year we heard the messages of His death and resurrection and the hope and victory that this act secured for us. Sin is conquered, death is defeated, the veil that once separated man from God has been removed giving free and unlimited access to Almighty God to all who will enter in. He sent His Spirit to indwell the imperfect people who would say yes to this, His invitation. He promised to never leave us or forsake us. So in the process of the spiritual housecleaning that I’ve done over the last few years I’ve picked up and put down a particular piece that for a while I could not determine if it fit in this temple that is me. It is the idea that “sin separates us from God.” I’ve heard this throughout my life, continue to hear it frequently, and have been one to have said it as well. Sin separates us from God. It sounds true. It feels true. It must be true. It was true before we came to accept this magnificent sacrifice. But as I’ve studied more deeply what Jesus said and did, I cannot find a place for this. If Jesus paid the penalty for sin – ALL sin – how can my sin change my position with God? How can God move away from me if He promised to indwell me and to never leave or forsake me? Was the veil torn down only to be put up again and torn down again and put up again…? Three beautiful words that cannot be reconciled with the idea that my sin brings back the veil. Does my sin matter? Yes. The call to repentance remains the same, but not because it is the only way to gain access to the Father again. We are to repent – to change our minds about sin – in order that we can live fully in the forgiveness purchased for us. We repent so that we can receive the fullness of the blessings offered us as His children in this lifetime and beyond, to have a right mind and a soul that is free from the burdens that sin will most surely heap upon us, and to enjoy the peace that comes with a heart ready to do His will. I have lived with a great deal of separation anxiety because of this misunderstanding, when all the while He was right there with me. I’ve lived in fear of His absence as there were no more sorrowful words on the day of His death than “My God, My God, why have You forsaken me?” It was agony for Jesus to be separated from His Father. But it was an agony He endured so that we would not have to. He is with us, faithfully leading us in the ways of righteousness, correcting – not condemning – us when we sin. He knew we would. Yet He has chosen a position of unfathomable mercy and extravagant love that will abide – make a permanent home – in all who will allow it. It is finished. This is the truth. This is the truth that sets us free. Free indeed!